No one truly knows the origin of Fernet Branca, Italy’s most iconic amaro. While the official story surrounds a Mr. Fernet and Mr. Branca selling their concoction as medicine, the factory workers will tell you about the clean iron ladle used to stir the components, fer net in Italian means “clean iron.” Regardless, Fernet-Branca began in 1845 and has 27 different herbs, spices, roots, barks, and botanicals including aloe ferox, bitter orange, saffron, cardamom, and chamomile, infused then aged for 12-16 months in Slovenian oak. 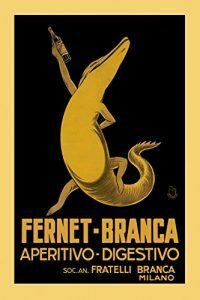 Fernet-Branca was prescribed to spark an appetite through the 1930s, and was even available in the USA during Prohibition! Today, the company is still family owned and operated and its popularity has sparked international and local versions as well. Enjoy Fernet on its own, in the Argentine Fernet and Cola, in the Old Fashioned variation Toronto, or in a shot with Campari called Ferrari.